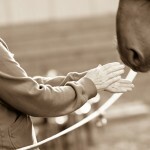 Snapshots of what it’s like at Riding Beyond from a participant’s perspective, someone new to horses. 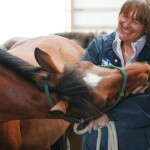 I woke up early the morning of the program with a nervous spot in my belly, thinking about a horse I would soon meet. I’d been through treatment for breast cancer and there were many residual effects that still hung on. Some were physical, some emotional, and some mental too. So the idea of stepping into a new and maybe challenging experience wasn’t a piece of cake. But life was calling, and saying yes to life had become more important than ever before. I set off in my car to find the horse facility with hat, correct shoes, and water bottle in hand (can’t go anywhere without that bottle still! – I’m sure many of you can relate). The directions were simple. I arrived there easily & pretty close to on time. ………Well, I had to break into that chatter. It wasn’t doing me any good. And, besides, it was so exciting to be there. — to be saying yes to a new adventure. I really wanted it to be good. I was ready for something that could trump, at least for now, the pain, the shock, the grueling day to day I’d endured with cancer. I was eager to open up my world a bit, to stretch myself in ways that I hadn’t had energy or stamina for in the past year. Down near the barn I saw a group of women who were gathered under a big tree. They looked like they were about to settle into a circle of plastic lawn chairs for the start of the session. I found out later that they were the volunteers who would assist Trish with the session. A few of them had also been through breast cancer treatment themselves. It was reassuring to have a little cadre to accompany me on my adventure. One of the women greeted me warmly, and then I met the other volunteers and Trish. I already felt something in me relax. I was pleased that I had come.. They turned out to be such a compassionate, supportive & interesting group of women. Trish invited me to join the circle and as I sat down she began to explain the program and the order of our morning activities. We would first sit in a group and get acquainted. Trish had us introduce ourselves in an unusual and delightful way, by telling a story about ourselves and an animal we have loved (wow! it’s amazing how much you learn about folks through their furry friends). 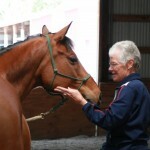 Next she explained that this horse experience often has calming benefits that can actually be measured by taking an oxygen level and pulse reading before and after interacting with Mystic. That was something we would do before and after each session. Trish continued her explanation of the program and then pulled out a sheet of paper and read a beautifully relevant poem to us. It left us all in a brief space of quiet introspection. In the following weeks the order of our morning would be similar but varied. There were new poems read, some we wrote ourselves. There was conversation about our experiences, photo ops (optional), and of course plenty of time with Mystic. The first morning, after we completed the meeting circle, it was time to meet Mystic. Well, she’s a beauty. As horses go, she’s not really large, Trish says, though she looks very large to me. She likes to eat hay…more than most things. I don’t get it, but then I’m not a horse. I walked slowly toward her with a few words of encouragement from Trish who was at my side. She said horses are sensitive, so it’s good to approach slowly. I appreciated her coaching and needed it. I felt that nervousness returning – mostly of the unknown I guess. 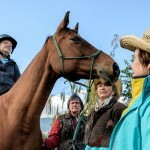 Participants spend the first session just getting to know Mystic, no mounting or riding. That comes on later days. She is very gentle. I talked to her, learned how to brush her, how to scratch her where she likes. I received some nuzzles and lots of intangibles I’ll mention more about later. 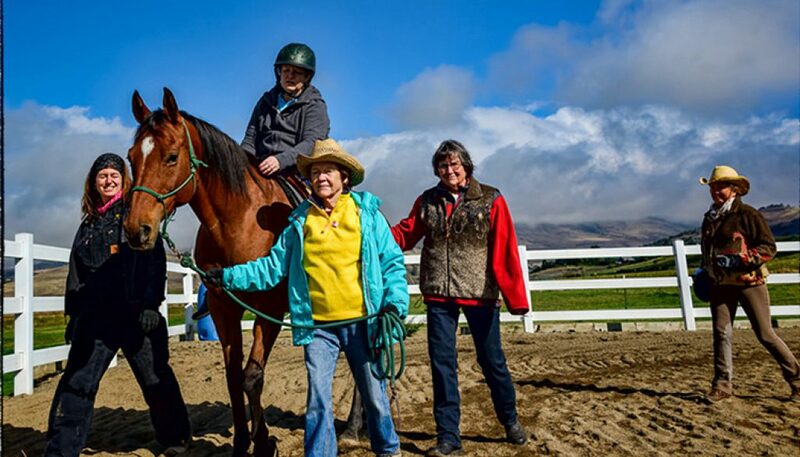 On days that I would mount Mystic, there were four volunteer helpers positioned around her. They were there to ensure that I would feel secure and to provide safety, though I personally never felt unsafe with Mystic. After meeting Mystic the first day, I was invited to practice mounting, dismounting & turning around using a “barrel horse.” The barrel horse is a contraption similar to what you see in gymnastics events (vaulting horse). It simulates the feel of a real horse. Working on it gave me confidence that I could maneuver adequately to get on and off the horse. I also learned to turn around to position myself backwards on Mystic, in a prone position where I could really soak in her beautiful energy. It’s easier than you might think and really relaxing and enjoyable. A few simple things I learned from Trish: 1) When you approach Mystic, approach slowly and offer your outstretched hand for her to check out; 2) She can’t see you properly if you stand directly in front of her because her eyes are on the sides of her head. So standing slightly to the side is better; 3) If she walks forward when you are scratching her, she is trying to position her rear end nearer to you to get scratched, so you should stay put and scratch whatever horse part comes in front of you; 4) You can walk behind Mystic if you make sure she knows you are there already – Trish will give you instructions on how to do that if you are interested, otherwise one should take a wide berth when walking behind the horse, as not to startle her. And of course there were many other tips that I gathered along the way. Relating the experience of being with Mystic is a little challenging because I found that talking with Mystic was a lot about non-verbal communication. I did talk out loud to her, but it was more the feeling level of things that opened my “dialogue” with her. That’s a little vague I know, but that was my experience. When I was quiet and just feeling and being entirely with her, something very sweet emerged. It was a precious connection. I took that sweetness from the session with me and carried it throughout the week. It was a heart healing that I very much needed with all that I had been through. It continues even now when I think of Mystic, nearly a year later. On a more concrete level, what happens with Mystic in the corral is this: I began by approaching her slowly and then having a chat. Then we had some petting, scratching and grooming. When we were feeling pretty comfortable (this was in the 2nd or 3rd session) I got ready to mount Mystic. I think I asked her if she was okay with that and if she was ready. Then I got up on her and sat briefly. Next I worked on turning around toward her hind end to lay belly down on her, as I had practiced on the barrel. It’s not too hard to do though it requires getting your knees up and over and around. Laying on Mystic is very comfortable and enjoyable. In your prone position your arms will hang down and you can stroke her hips and just relax and breathe with her. It can be a very healing sensation. When you are ready you reverse the process to get off Mystic. The dismount is simple and has also been practiced on the barrel. Other times I would ride Mystic slowly around the corral with Trish & the volunteers close by. We might walk to music for a few minutes each session, and when we all got into synchrony together, it was a joyful few moments. Some participants find this especially poignant. After dismounting and completing this part of the session you often will spend a little more time with Mystic, just thanking her, talking to her and listening to her horse language. Eventually, during one of the future sessions, you might be invited to take some time to hang out with her by yourself if you wish. For me, that was a particularly treasured time. If I could speak with you I would do everything in my power to convince you to sign up today! Mystic is a love and I am sure your experience will be healing and invigorating. Trish and the volunteers are the best. Step out there! You owe it to yourself. You’ve been through a lot. It’s time to have some fun now!